Imam Ali Ibn Abi Talib (a.s) was born on Friday 13th of Rajab 30 Amulfeel when Hazrat Fatima binte Asad, the wife of Hazrat Abu Talib (a.s) entered the precincts of the Kaaba and prayed to Allah saying O’my protector ease my pain.’All of a sudden the wall of the Kaaba opened up and she, as if by some unseen force went inside the Kaaba and the wall closed. 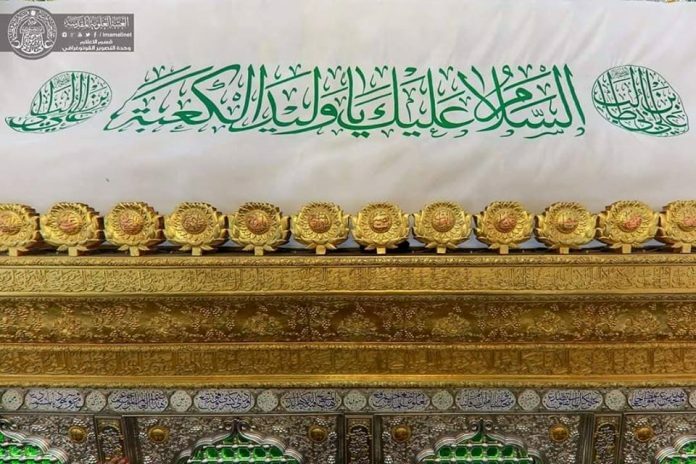 ‘Ali (as) the youngest son of Abu Talib was born inside the Holy Kaaba. She stayed inside for three days. On the 3rd day she came out through the door and Muhammad was waiting outside. She told Muhammad (S) that the boy had not taken any milk. Muhammad gave him the first feed from his mouth and afterwards asked his uncle Abu Talib that he wished to adopt the baby. ‘Ali entered the house of Muhammad from the very first day of his birth. ‘Ali’s mother Fatima binte Assad also lived there who looked after his own son as well as Muhammad (S) so much so that later the Holy Prophet used to say that she was like his own mother. Shah Waliullah, Mohadith-e-Dehlvi writes in the book “Izalatul Kholafa” giving reference from Imam Hakim in his Mustadrak Part 3, Page 483. Qud Tawatarul Akhbar Inna Fatimah Binte Asad woledat Aliyan Fi Jaufil Kaaba”. Another writer of the old school Sibtel Jauzi in his book Tazkeratul Khawas ul Umma, page 7 mentions the same fact that ‘Ali was born inside the Kaaba. Khawja Moinuddin Chishti Ajmeri mentions this fact in his famous Quartet saying that when ‘Ali was born inside the kaaba the Sky and the earth was filled with a light and Angel Gabriel announced that a child was born in the house of God. Masoodi the famous historian writes in his book of history Muruj el Zahab, that ‘Ali was born inside the Kaaba on the orders of Muhammad the Messenger of God. It was after the adoption of ‘Ali (as) that he lived with the Holy Prophet in his house. Some historians try to show that when Muhammad (S) declared his prophet hood ‘Ali (as) was the first among male children who accepted Islam. The implication here is that both Muhammad (S) and ‘Ali (as) were non -believers before this declaration. This is against the Qur’anic verdict which says that Ibrahim was a Muslim and he taught his children to be Muslims so that when the Prophet was born among the descendants of Ibrahim through the line of Ismael he was born a Muslim and so was ‘Ali. The correct thing to say would be that when Muhammad (S) declared his prophet hood openly ‘Ali (as) immediately adhered to the declaration without hesitation. Invitations were sent to leaders of the Banu Hashim to come to the house of Muhammad (S) for Dinner. Forty of them came, ate food and then heard Muhammad (S)about his mission of ‘ No god but Allah and Muhammad (S) as the messenger of Allah and whoever offers his help to propagate this religion will be his deputy and successor. No one stood up except ‘Ali (as) . After announcing this 3 times Muhammad (S) declared that ‘Ali (as) will be his deputy to his mission and will be his successor after him. People thought it as a joke that a 13 year old boy was to be a deputy of this prophetic mission. Even Abu Lahab jokingly told Abu Talib, go and obey your son to which AbuTalib smilingly accepted. ‘Ali (as) promised to help Muhammad (S) in his mission and kept this promise all his life. The next thing which we see in the life of ‘Ali (as) is the reflection of this promise he gave at this place in front of the leaders of the Quraish. We see ‘Ali (as) protecting Muhammad (S) from the abuses of the enemies of Islam. When Muhammad (S) went to Taif a nearby town to preach Islam children of Taif hurled stones and it was ‘Ali (as) who protected the Prophet and drove the stone throwing children away from the Prophet. As a youth ‘Ali (as) was strongly built, strong arms, wide chest and a very strong brave and shining face. Children of his age and even older to him were frightened of him and whenever they tried to mock the Prophet, they always ran away when they saw ‘Ali (as) standing by for protection. Time passed and hostility of the Quraish increased so much so that Muhammad (S) was ordered by Allah to leave Makka. ‘Ali (as) slept on Muhammad’s bed without hesitation and when the non-believers entered the house of Muhammad (S) to kill, they found ‘Ali (as) who was not afraid at all at the site of 40 swordsmen entering the house. When they questioned ‘Ali: ”where is Muhammad” he bravely replied, did you leave him in my custody? When after 3 days of Muhammad’s departure ‘Ali returned all the goods entrusted to Muhammad to their owners, he set out to leave Makka for Madina with the rest of the family. ‘Ali (as) had with him his mother Fatima binte Asad, His aunt, the wife of Hamza, and Fatima, the daughter of Muhammad (S) and many other ladies. Non-believers of Makka tried to stop ‘Ali (as) from his departure but ‘Ali (as) fought back, drove the infidels away and safely reached Madina. Muhammad (S) was waiting for the family outside the precincts of the town. He entered the city with ‘Ali (as) and the rest of the family. The Holy Prophet created a bond of brotherhood between the Muslims, making ‘Ali (as) as his Muslim brother saying O’’Ali, you are my brother in this world as well as in the next. Once the family settled in the newly adopted city of Madina their first task was to complete the mosque around which their houses were also built. ‘Ali initially stayed with his mother but when he married Fatima the daughter of the Prophet he was given a house next to the Prophet by the side of the mosque. He had been betrothed to her several days before the battle of Badr. But the marriage was celebrated three months later. ‘Ali was about 23 years old and Fatima was 18. This was most happy and celebrated marriage. The distinctiveness of their respective characters blended so well with each other that they never quarreled and complained of one another and led a happy and most contended life. Materially the couple did not possess much, spiritually they were at the highest level of assent. They had no worries if they go hungry or their clothes had patches. They would be more concerned if an orphan goes away from their door without receiving any food. History records ‘Ali’s life in Madina with the Holy Prophet for the next ten years as the busiest in defending Islam against the attackers from Makka. ‘Ali (as) was always the standard bearer of the Flag of Islam in all such battles and his bravery became legendary. Ibne Abil Hadid, the Motazelli commentator of Nahjul Balagha says that: ‘Ali (as) had a personality in which opposite characteristics had so gathered that it was difficult to believe a human mind could manifest such a combination. He was the bravest man that history could cite and such brave men are always hard hearted, cruel and eager to shed blood. The battles of Badr, Ohud, Khandaq and Khyber were fought in the defense if Islam and won on the hands of ‘Ali (as) . He was not only the standard bearer of the Flag of Islam in these battles, but always led the forces of Islam against Kufr and came out victorious. Khyber was the climax of these battles when ‘Ali’s victory brought prosperity in the Muslim ranks. Ayesha the wife of the Prophet said once that until the victory of Khyber we in the house of the Prophet spent days without food. It was only after Khyber that life at home became a little easier. Thus ‘Ali (as) brought an end to the hostilities of Quraish in three encounters of Badr, Ohud and Khandaq. Their best warriors were killed, their unity against Islam was crushed, their pride was humiliated and their prestige before Arab clans was lowered by him and by him alone. Khyber saw an end to the hegemony of Jews in Arabia at the hands of ‘Ali (as) . The peace agreement of Hodaibiya was written by ‘Ali (as) and at the time of the peaceful victory at Makka, the idols of the Kaaba were demolished by the Holy Prophet with the help of ‘Ali (as) .Details of these battles were shown in the life of the Prophet.